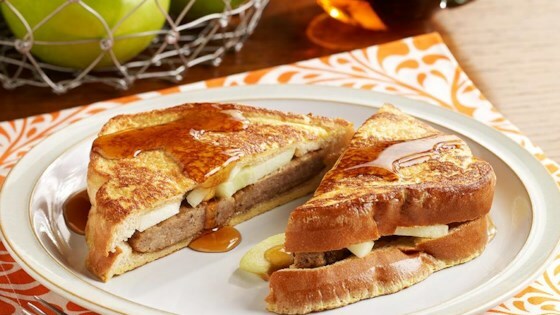 "An apple stuffed French toast recipe with maple-flavored syrup, Granny Smith apple slices and sausage patties--perfect as a breakfast for dinner option." Whisk together Egg Beaters and Reddi-wip in large shallow dish; set aside. Heat sausage in microwave according to package directions. Meanwhile, spread syrup evenly over bread. Top each of 4 bread slices with 1/4 of the apple and 2 sausage patties. Top with remaining 4 bread slices, syrup-side down, to make sandwiches. Melt 1 tablespoon Parkay in 12-inch nonstick skillet or large griddle over medium heat. Carefully dip 2 sandwiches, 1 at a time, in Egg Beaters mixture, coating both sides. Place in skillet; cook 2 to 3 minutes on each side or until golden brown. Repeat with remaining Parkay, Egg Beaters mixture and sandwiches. Cut each in half to serve. Top with additional syrup, if desired. Elegant stuffed French toast is served with a delectable peach sauce.